Are you into Valentine’s Day or is it commercialised nonsense to you? I have to say that despite being very happily married, (we’ve been together 24 years and married for 17! ), my husband and I don’t get take much notice of 14th February. We prefer to wine and dine and share gifts more spontaneously throughout the year. Having said that, I couldn’t let a blog post being published today go without a nod to the occasion, maybe it’s a big thing for you? 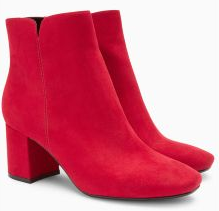 So, without going overboard on the hearts and flowers, I’ve done a round-up of my favourite ‘red’ things that are currently out there on the high street, for your perusal. 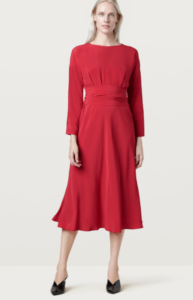 How much red would you feel comfortable wearing in an outfit? Your clothing style determines how much of this bold colour you’ll feel good in so don’t worry if it seems a bit scary. I’ve included something for everyone. If red is a little out of your comfort zone, but you’d like to give it a try, start with a red lip. 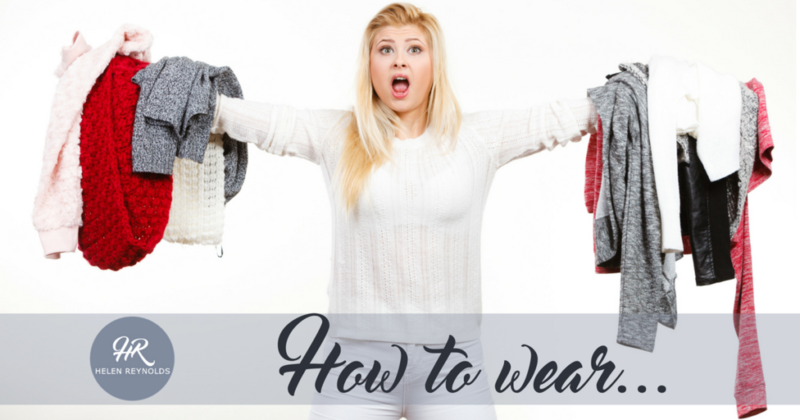 But first, a few important tips on how to get it right. 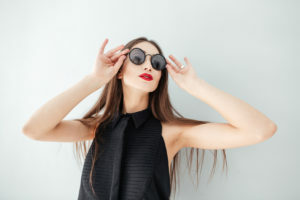 Firstly, a red lip will highlight any area of redness on your face, so be extra careful to even out your skin tone with foundation and/or concealer. Secondly, consider using a red lip liner to keep this strong shade in place. I used to be able to get away without a liner but these days, my lipstick moves into those creases…. And thirdly, choose a shade of red that is flattering to your eye colour and skin tone. If you haven’t had your colours ‘done’ by a professional image consultant, experiment using warmer, orange toned reds, a true red and a blue-toned one to see which works best. A quick way to do this, (without getting in a mess with all the testers at the make-up counter) is this. If you suit gold jewellery more than silver, go with a warmer, orangey red and if silver is more flattering on you, opt for a blue toned shade. And finally, if a red lip feels way too scary, blot it to within an inch of its life, so that you are left with just a tint. Likewise, a red handbag worn with a neutral outfit is a winning style statement. 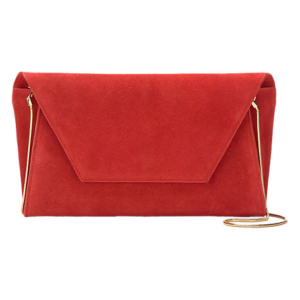 I love the soft texture of this elegant evening bag. For a more dramatic look, try red patent. If you like to wear red and are looking for new ideas, these are for you. This is such an easy blouse shape to wear and the pleating means it hangs beautifully. 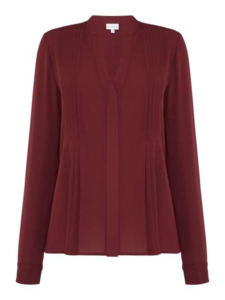 This would be elegant worn over evening trousers or understated worn with your favourite jeans. Either way it’s a great and easy piece. 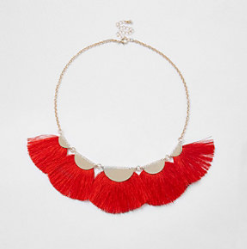 This shade of red (berry) is flattering on a cooler skin tone – try it if you suit silver more than gold jewellery. You know what they say about girls that wear red shoes? I’m sure it’s not the same if we are talking boots! Liven up your outfit with a splash of red on your tootsies. You could use the boots as the colour in the outfit or match them up with a red top or scarf. 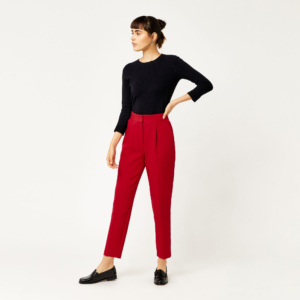 These peg leg trousers are a good shape for a pear or hourglass shaped figure type and the ankle skimming length is the length of the moment. Great for showing off great footwear, whether flat or heels. 3. Totally loving red! If you are happy to embrace the colour of love, make red the main event of your outfit. For some women, only a red dress will do for a date. This beautiful flowy look is best for small waists and curvy hips. And it has sleeves so no need for trying to match it up with a jacket. 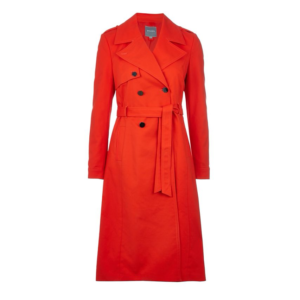 A red coat is a cheery addition to your wardrobe and I am a MASSIVE fan of a mac. They are possibly the most versatile of coats and work through most seasons here in the UK. Tie the belt off centre if you like to emphasise your waist and at the back if you feel like a sack of spuds in a belt. Or, leave it open for an uber-cool casual look. So, that’s my round up of red for Valentines, whether you are massively into it and pulling out all the stops, or ignoring it altogether and staying in for a cosy night and a nice cup of tea, I hope I have given you some food for thought. Leave me a comment below and share your thoughts on wearing red. How much are you comfortable in?